RV-Series - Long-Lasting Performance, Tremendous Value! 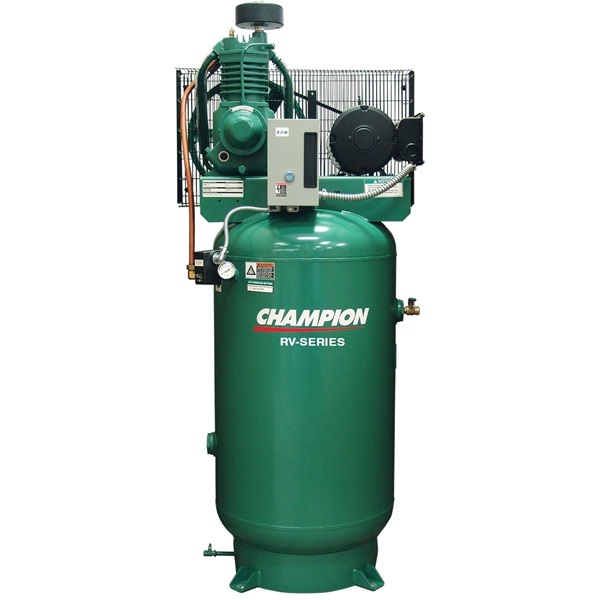 At Champion®, air compressors are their only product - Made in the USA* for over 85 years! Whether for hobby or business, Champion® is the right choice for years of trouble-free service! 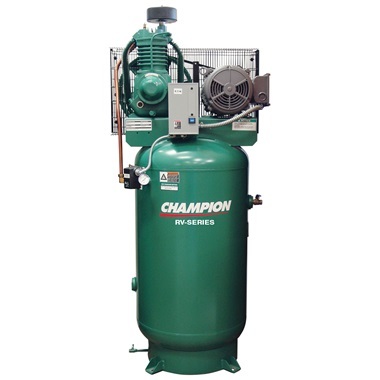 Champion® Compressors will run air tools, paint spray equipment, abrasive blast equipment, or other air-operated tools and equipment. Heavy-Duty Model. Choice for larger repair and body shops! Features pre-wired magnetic starter and higher amperage motor for long operating hours. Photo may vary from actual unit. Built to order - allow 5-7 days lead time. Drop shipped direct from manufacturer. *Made in the USA with both US and foreign parts. Champion®, a Gardner Denver Company, knows and understands the application of their products in many different operating environments. Their goal is to provide a compressor that meets and exceeds your expectations. Loaded with rugged features, the splash-lubricated RV-Series Reciprocating Compressors deliver long-lasting performance and tremendous value! Received compressor this week and went to wire it up. Immediately noticed that the small black plastic insert plate on the magnetic starter is missing, leaving large hole into the magnetic starter box. See product description photo, that black rectangle to the right of the RESET switch on the mag starter box. Clearly won't pass electrical inspection with easy access for hands or objects to touch the motor wiring/mag starter terminals.Called TPTools, was told to call Champion directly. Call Champion, get kicked around between 4 people in different departments and ultimately told this is a warranty issue (on a brand new compressor which was just delivered) and that I'd have to call a service center and that they don't deal directly with the public. Service center called, unable to give an estimate for time frame in receiving the part.Cannot have electrical inspection done or operate compressor without this small plastic part, rendering the compressor completely unusable until part arrives. Disappointing customer service from all involved.Will update review when part is received. Forget about bleeding the tank manually. No more crawling around and sticking your hands under the tank. This thing keeps the tank purged and dry. Service & Delivery comments: 2 days as usual. Exactly what I needed. This combination does it all. This system was well thought out. Being modular I can add or change anything. There may be more expensive filters and regulators out there but they can't perform better. The automatic drain makes this setup run with almost no attention paid to it. Service & Delivery comments: Got it in two days as usual. I should have ordered this a long time ago. Here at Merry Go Round Stained Glass, we have used sandblasted glass in our windows for over 35 years. One of the challenges we run into is regulating the air pressure. When we are dimensionally carving the glass we must have easy and precise control of the pressure. This set-up is the best we have ever used. Service & Delivery comments: Shipping was very fast! Thank you!